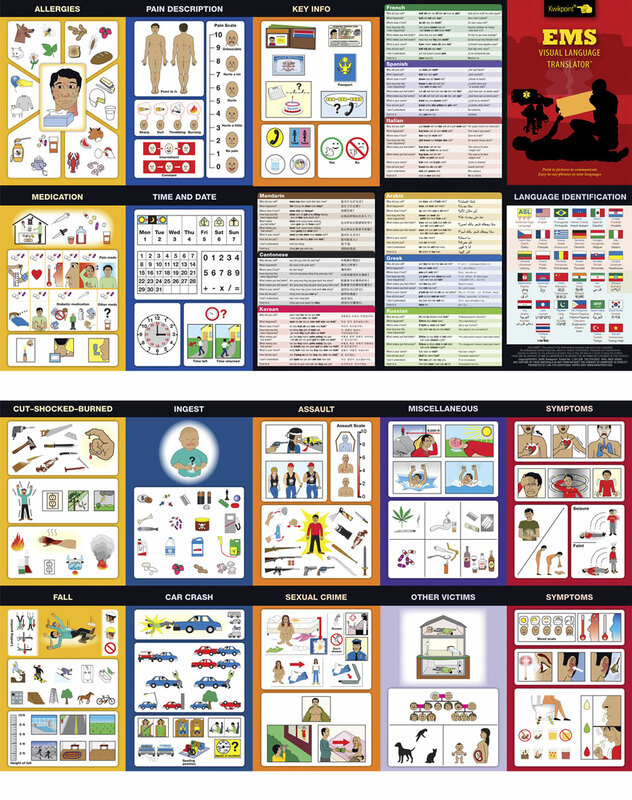 Kwikpoint developed the Emergency Medical Services Visual Language Translator for the Fire Department of New York (FDNY) Emergency Medical Services, who field-tested it for effectiveness in specifically addressing and overcoming language barriers in medical emergencies. Used by medical personnel to quickly assess emergency situations and victim injuries with clear, concise graphics designed to foster two-way communication when no interpreter is available. Topics include car crashes, assaults, sexual crimes, falls, and other emergencies. Related topics include pain symptoms, medication, overdoses, allergic reactions and toxic ingestions. Also contains critical words and phrases with easy to say phonetic pronunciations in 9 languages, and a language identification chart. The compact, hinge-laminated format makes it easy to handle and wipe clean, and fits most pockets for quick access.